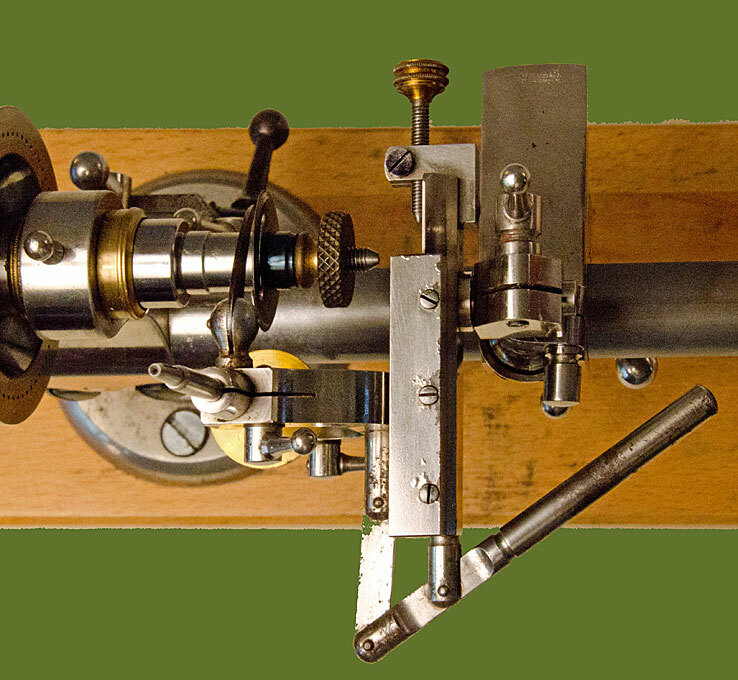 Some 30 years ago I acquired a hardly used and then probably about 50 year old Wolf, Jahn & Co. 6 mm watchmakers lathe from an old watchmaker in Nottingham, who sold it in commission. And this was the beginning. I did not know very much about these machines, but started to collect literature on them - and then of course the real thing. In the meantime I have brought together an almost complete set of whatever accessories and gadgets were made and listed in the catalogues, albeit it is a mixture of Wolf, Jahn & Co. and Lorch, Schmidt & Co. The former is indeed quite rare in comparison to the latter. 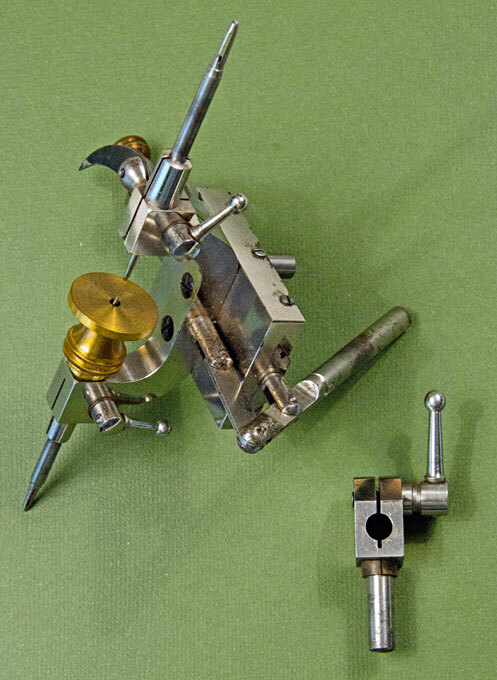 In order to increase its machining capabilities I also made various new or improved existing accessories: a quick-change toolpost, a knurling tool, a boring-bar holder, a fixed steady, a motor-drive for the grinding and milling spindle, carriage stops, etc. (5) Selection of original spindle tooling (click on image for details and legend) (6) Selection of shop-made accessories (click on image for details and legend) (7) Vertical milling slide. Would be used to cut gear wheels etc. 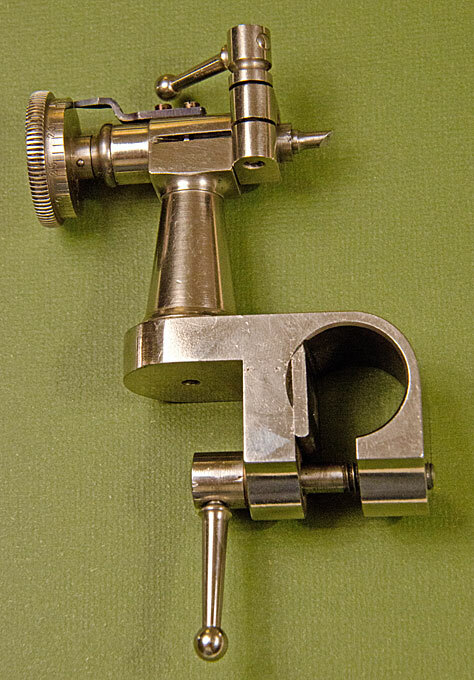 This early model replaces the top-slide on the cross-slide arrangement. Later models were fitted on top of the top-slide. They took power from an overhead drive. 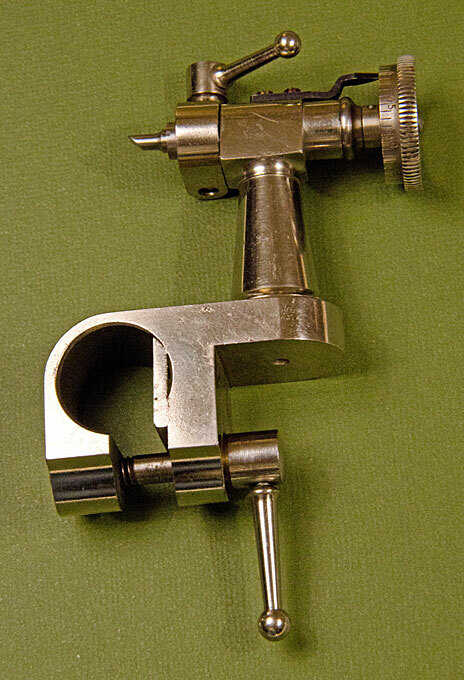 (8) A rotating spindle-stock and the vertical slide fitted with a grinding and milling spindle. This tailstock would be used to mill wheels with oblique angle tooth or to turn slender tapers. Also shown is a box chuck. (9) Set up showing the use of a safety pulley system. It fits into the main spindle. 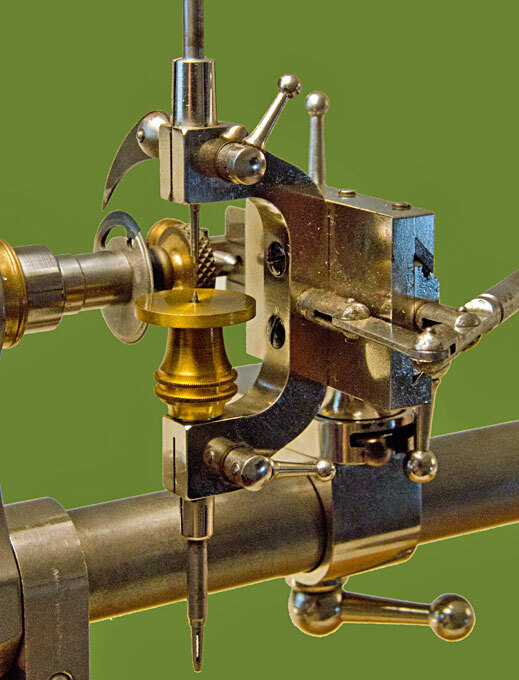 Power is taken from the back pulleys via a thin cord and the loose pulley on the small arm controls the friction of the cord on the main pulley. The work is put within centres, here a turning arbor for working on small bushes etc. is shown. The tailstock is fitted with an an universal runner that in turn takes a variety of inserts, here a plate with very fine female centres. There is usually a set of three plates with hollow centres of different diametres. 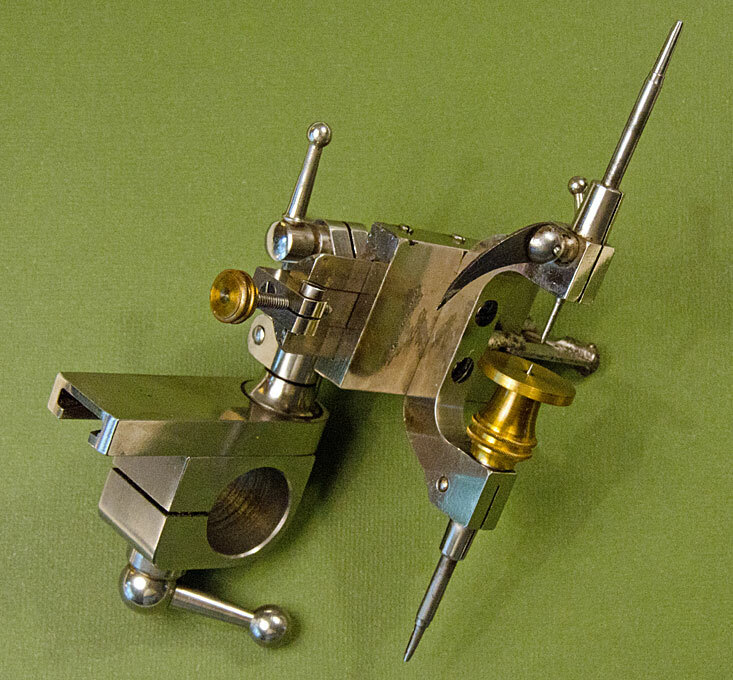 Also shown a standard T-rest for freehand work with a graver (the traditional practice of watchmakers). 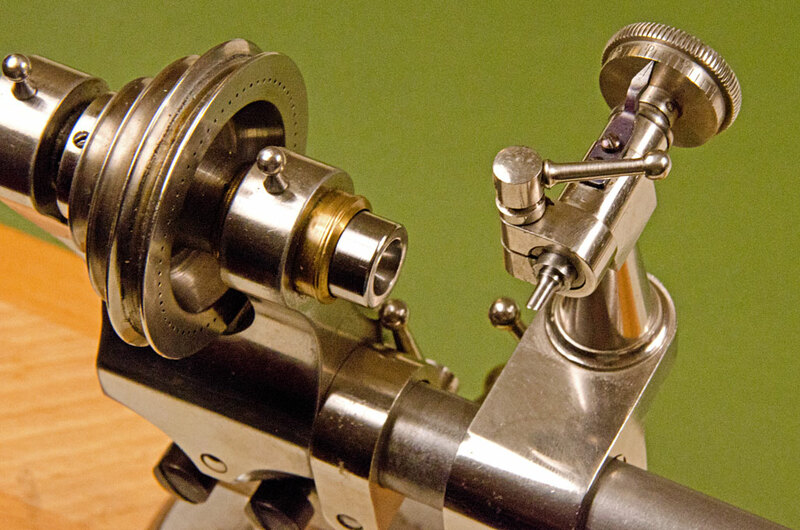 (10) Set up with an older model 6-jaw scroll chuck and a small drill held in a split chuck in the tailstock. 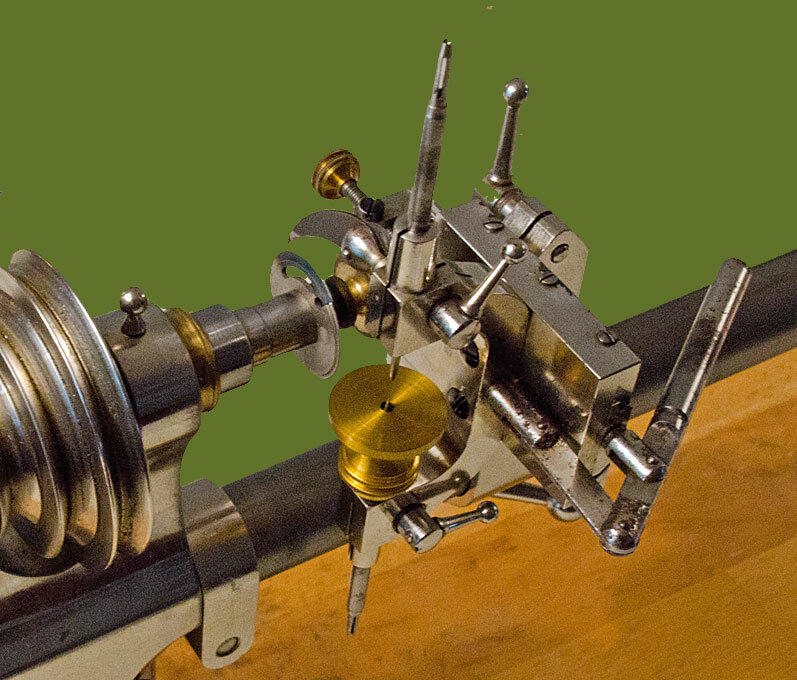 (11) Set up with 3-jaw scroll chuck and a sinking tool that has a taper to fit the standard tailstock runner. The sinkers where made in sets for various diameter recesses. Shown here is an insert pinole with lever that has the same taper and can be used instead of the standard runners. Also shown a small tool to hold flat items in the 3-jaw chuck for drilling. 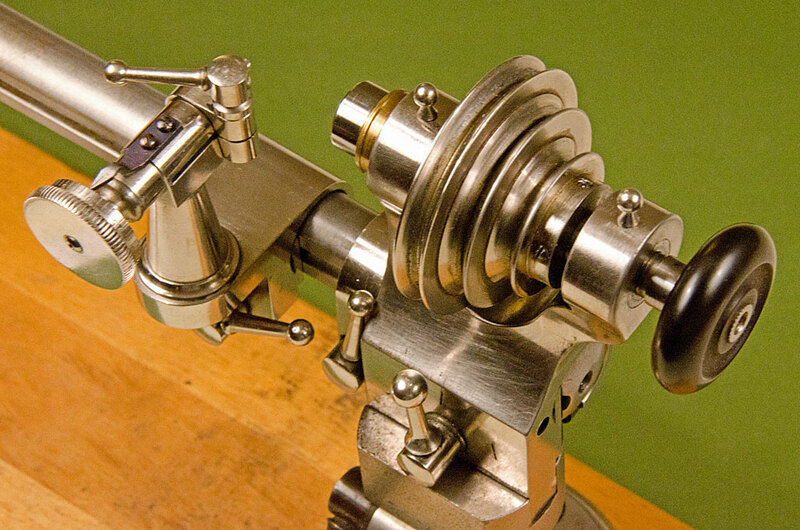 (12) Set up with a sort of face plate that replaces what the watchmaker call an ‚uprighting tool‘. These are used to drill holes perpendicular into watch plates. 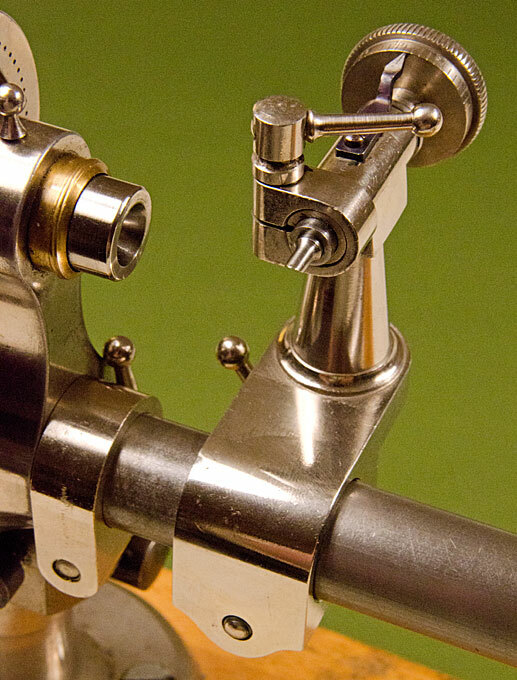 A small drill is held in a split holder that has a taper to fit the standard tailstock runner. 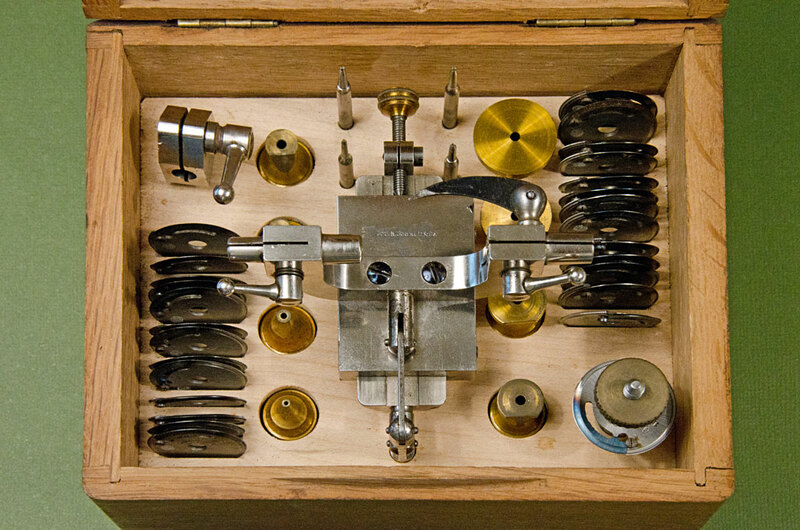 The holders where made for 1 mm and 1.5 mnm shaft watchmaker‘s drills. (13) Pivot drilling on the lathe. The universal tailstock runner is fitted with a centering plate. The drill is held in a miniature sleeve holder that fits into a taper of the inner runner. The sleeves where made to fit the standard watchmaker drill shanks of 1 and 1.5 mm diametre. (14) Another insert for the universal tailstock runner are jacot drums that turn the lathe into a ‚jacot-tool‘ or ‚pivot polishing tool‘. The stem to be burnished is put into a matching groove on the drum and the burnisher (steel or tungsten) applied. The groove has been centered before using the running centre. Also shown is a tip-over T-rest. 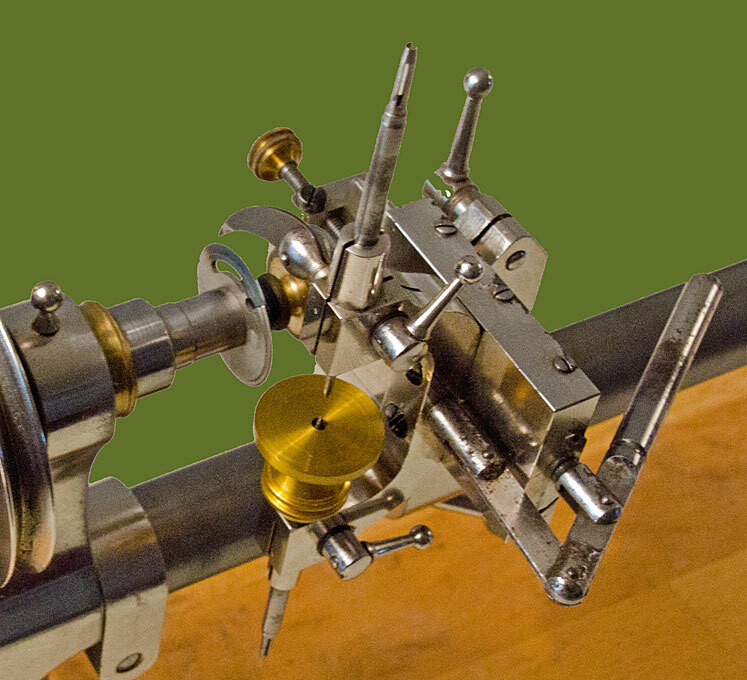 rounding-up cutter is held in an arbor in the lathe spindle. The topping tool is centred with respect to the cutter using a pointed index. 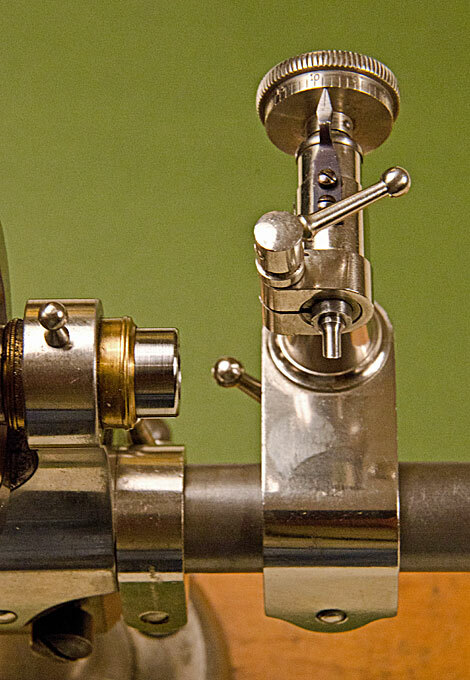 regulated with a thumbscrew as a stop. The Carpano cutters have an integrated cam that moves the wheel automatically by one tooth. (16) A right-angle tailstock (Lorch, Schmidt & Co. part no. 58e). This is effectively a fixed steady for working on very thin parts. 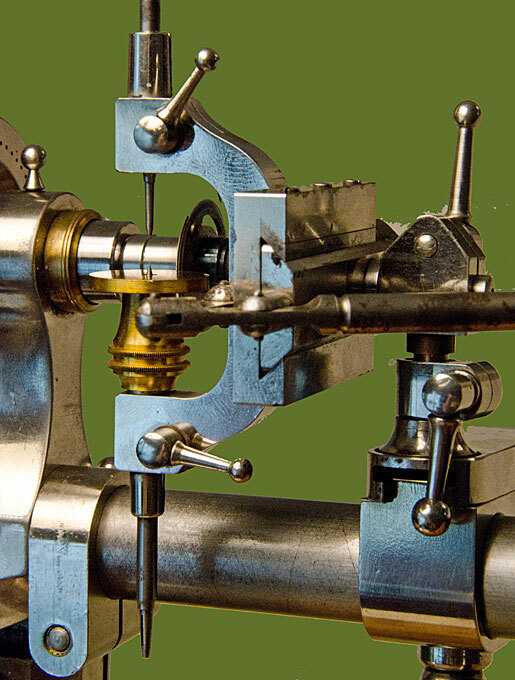 The supports are interchangeable and have the same taper as the the tailstock runners. 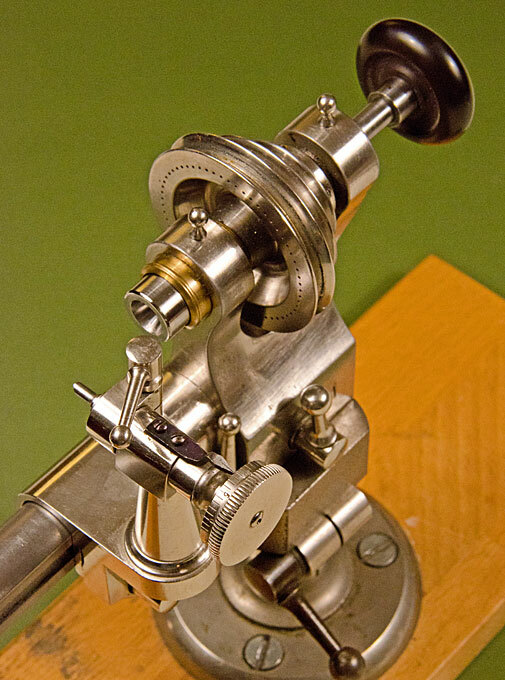 The distance to centre can be adjusted using the micrometer-screw. It is an extremely rare item. I have only seen two in 30+ years of collecting.